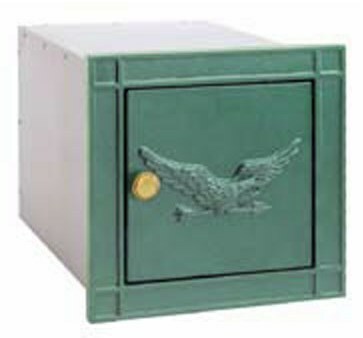 Shop secure indoor and outdoor pedestal and surface/wall mounted metal mailboxes for Washington homes and businesses. U.S. Mail Supply offers great rates on shipments throughout the United States. Find the perfect locking commercial mail box for your interior space or for outdoor areas of apartment complexes. Customize your metal mailbox as a pedestal mount or wall mount for interiors. For many models, front or rear loading options are available. Buy big and small commercial mailboxes for sale online from U.S. Mail Supply – indoor surface / recess wall mounted horizontal and vertical mailboxes or outdoor pedestal cluster mailboxes for apartments, condos, offices, schools, hospitals or government buildings. Shop lockable horizontal STD-4C mailboxes and 4C pedestal mailboxes for private delivery. Customize desired mail slots and outgoing package lockers. A reliable option for interior recess wall mounted applications. To qualify for USPS approval, mailboxes must adhere to strict USPS regulations in terms of box size, accessibility and identification info. Easy installation for compliance with USPS standards. Shop all sorts of styles of apartment mailboxes for sale from U.S. Mail Supply – from Victorian style decorative cluster mailboxes for high end & luxury apartments to standard 4C horizontal mailboxes for lobbies and interior areas. U.S. Mail Supply carries outdoor locking mailboxes for USPS delivery or private delivery, including elegant vintage style cluster mailboxes and modern pedestal mailboxes for easy delivery. 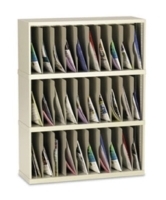 We’ve got a large variety of indoor horizontal & vertical mailboxes in stock to perfectly fit your interior area. Customize your mailbox (front/rear loading, surface/wall mount) to make the very most of your space. Shop our stock of metal residential wall mounted mail houses and post mounted outdoor locking mailboxes. We carry mail sorters and literature organizers for mailrooms, offices, classrooms, and any other situation where you need documents organized. Metal mailboxes stand up to wear and tear and heavy use over time. 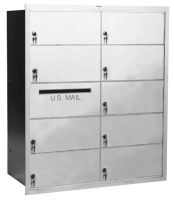 Multi-unit metal mailboxes are built tough with aluminum and steel for longevity and durability. Going with a cheap option will only have you shopping again in a few years. Security mailboxes with combination locks or keyed entry reinforced with heavy metal offers a long-term secure solution. Please contact us if you need any assistance in finding the right mailbox for you. U.S. Mail Supply offers a variety of outdoor pedestal mailbox units and private use indoor mailbox units for Washington public and private buildings. No matter what your needs are, we have the mailbox unit for you – outdoor pedestal mailboxes are durable options, available in a wide variety of configurations and styles from decorative to standard. Indoor mailboxes are built with aluminum and stainless steel, with the option of either rear loading or front loading, depending on your application or preference. U.S. Mail Supply, Inc. is a leading distributor and manufacturer of commercial and residential mailboxes, post office boxes, mail sorters, and more in the Washington state area. Give us a call today to learn more about finding the right mailbox for you. U.S. Mail Supply offers a few design assistants to help you get the right quote on the mailbox you’re looking for. Sometimes it’s not as easy as picking a base model and crossing your fingers. Our customization forms help you choose the right loading type, delivery options, dimensions, slot count and mounting options.